If you are interested in how Bet365 matches up in terms of their MMA betting options and odds, check out our MMA sportsbooks page that goes over all of that information. Here you will find the basic information about the Bet365 sportsbook. **Due to advertising restrictions I’m not able to elaborate on the Bet365 bonus. Click the above link to see the full details of the bonus at the Bet365 website. The banking options accepted by Bet365 varies depending on where you live. 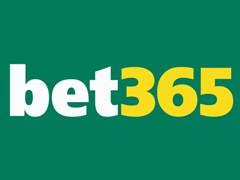 Visit Bet365.com to see what deposit and withdrawal methods are available to you. The most popular ones for most countries include Visa, MasterCard, Moneybookers, Click2Pay, Entropay and bank wires. Bet365 is the most popular sportsbook in the United Kingdom and well known around the world. They are known to offer a wide variety of betting options, live odds and great promotions. It is very rare to hear anything negative said about Bet365. The customer service department at Bet365 is very strong. You can contact a representative 24 hours a day via email, live chat or toll free telephone. Any problems that you may have are taken care of swiftly.